Many of you may know I quilt my tummy tucks. However, you may not quite understand what that means until you have your consultation. For this reason, I’m going to explain the benefits of a quilted tummy. In the most common tummy tucks, excess skin is lifted up from the abdominal wall. The underlying muscles are then repaired, and then the skin is trimmed and laid down again. This is like making a bed and pulling down the sheets. A binder is placed afterward so the skin is pushed against the abdominal wall, allowing it to adhere to the abdomen in its new location. The problem with this classic approach is that in some cases, the skin does not adhere, leading to collections of fluid under the skin called seromas. Seromas usually require non-operative treatment, but can require multiple in-office drainages and slow down the recovery process. In rare cases, a seroma can require reoperation to make the tissues stick down again. About 10 years ago, I met with two plastic surgeons at a conference. These Midwestern brothers in-practice had added a step to their tummy tucks. 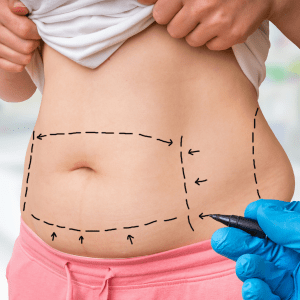 Rather than just laying down the skin at the end of a tummy tuck, they were actually sewing it back to the abdominal wall, or “quilting it” from underneath. Their thinking was that this quilting would speed the healing process, and minimize the risk of seromas. They were right. I began to incorporate quilting into my tummy tucks and mommy makeovers shortly thereafter, and now I do it on all of my abdominoplasties. I rarely – if ever – see a seroma anymore, but in my opinion, the benefits go far beyond preventing seromas. With quilting, we can pull down on the skin as we sew it down. I believe this translates into lower, narrower scars, and lower risks of healing problems. We can take away tension from the lower abdomen where the blood supply to the tummy tuck is most tenuous. We can anchor the scar in the lower abdomen in an effort to keep it as low as possible. This decrease in tension may, genetics permitting, lead to a narrower scar. Tummy tucks are a “push me, pull me” surgery. We pull the skin down, but then pubis and scar want to rise up. I believe that quilting helps keep the tissues lower and better hidden. Some doctors who quilt the abdomen don’t leave drains. The thinking is that if the tissue heals down more quickly, then there will be less fluid oozing and less need for a drain. While I think this is true, there is always some oozing anyway. If fluid remains under the skin, it can become infected. Because of this, I personally still leave a drain as a safety precaution; I call it an exit strategy for fluid. Without a doubt, quilting has diminished the length my drains stay in. Most patients get the drain out at their first post-operative visit. I believe that quilting can diminish the postoperative risk of bleeding. Tissues heal more quickly, and even if there were post-operative bleeding quilting divides the abdomen into separate spaces. In those rare instances of a post-operative bleed, it is likely to be localized to a smaller area and self-limited. Quilting adds about 10 to 15 minutes or operating room time, which is expensive, but I think the upsides are of far more value. To me, it has been a game changer. If you are considering getting a tummy tuck, schedule a tummy tuck consultation with me. To schedule a consultation, you can contact me online, or call the office at 301-656-6398.